We wish we could say that we met this amazing brand on the slopes while filming an action-packed snowboarding video. 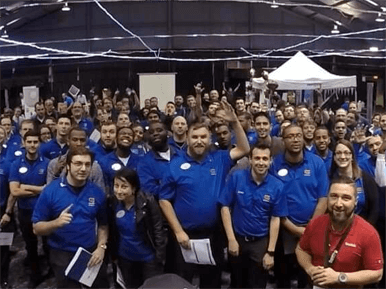 However, our initial partnership really began with GoPro’s need for a third party labor provider that understood their brand, had the right connections at retail, and could supply them with a quick and effective retail ready solution. GoPro is such a fun brand to work with, they have done a really great job establishing a brand presence out in the market, and we have been able to leverage that from a retail marketing perspective. Our partnership with GoPro has allowed us the opportunity to leverage a wide variety of BDS solutions for them, which is always exciting to us, as an integrated retail marketing strategy produces the best results! With their iconic action cameras, rad user-created content, and diehard fan base, GoPro quickly became a mighty force in the consumer electronics world. GoPro essentially created their own category at retail, and has since dominated the store floor with innovative displays, brand-conscious PoP, and stoked associates. Since the beginning of our partnership, we have activated a variety of services for GoPro, from Merchandising and Break Fix, to Assisted Sales and Market Development. 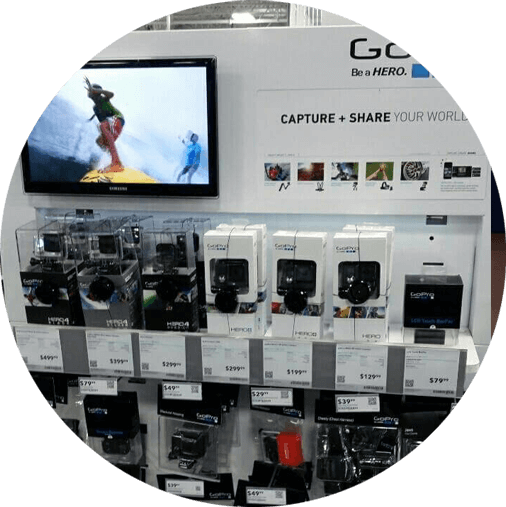 Our highly branded, passionate, dedicated team of GoPro experts provides a hybrid of all these services to successfully provide a great customer experience and deliver the brand promise at retail. However, as their products became more popular with customers, they recognized a need to not only grow their presence in stores, but control their brand experience overall at retail.